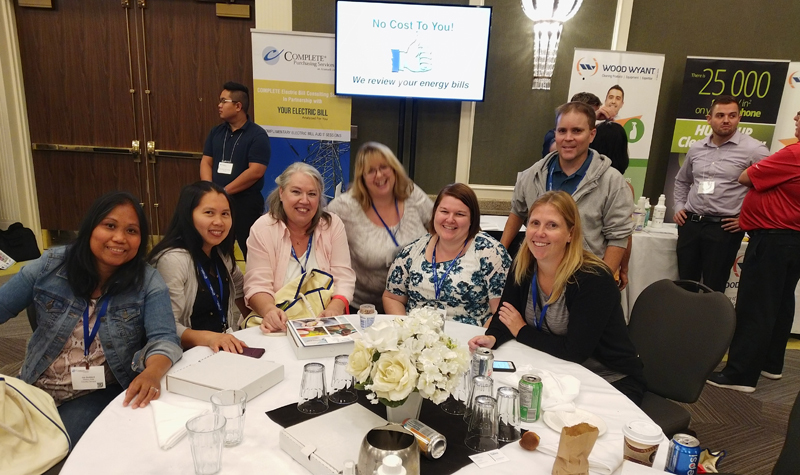 The Country Terrace IDDSI team is seen here during a recent workshop in London, Ont. hosted by Complete Purchasing. Country Terrace’s nine-member International Dysphagia Diet Standardisation Initiative (IDDSI) team attended a Sept. 19 workshop hosted by Complete Purchasing to help prepare the Komoka long-term care home for when IDDSI is fully implemented by OMNI Health Care’s 18 long-term care homes in January. OMNI is adopting the IDDSI framework to help enhance quality by standardizing the language surrounding food thickness for residents with dysphagia, the medical term for swallowing difficulty. The implementation process began in early 2017 and is expected to be complete in January. At the core of the framework is an eight-level scale, numbered zero to seven, measuring the thickness of food. Zero refers to thin liquids, like water or fruit juices; Level 7 is regular food. “The goal (of attending the workshop) was to listen to the Complete Purchasing IDDSI team … to get more detail from people who are working all day with IDDSI so they have a good understanding from an operational point of view,” says Country Terrace nutritional care manager (NCM) Alex Achillini. IDDSI is gaining momentum worldwide. Part of the workshop, which was held in London, Ont., was spent learning about where countries are at in terms of implementing the framework, Alex says. This was important, the NCM adds, because it helped the team understand the issues jurisdictions around the world have faced during implementation. Alex says the workshop also included discussions about food textures, and the team even learned about a recipe for minced bread that people with dysphagia can enjoy.